Shutterfly asked if I would like to attend their 2014 Shutterfly by Design event followed by a cocktail party at the home of Kevin Sharkey, SVP, Executive Editorial Director of Decorating, and Executive Creative Director of Merchandising at Martha Stewart Living.Um, let me think about that for a second. Yes of course! Just lovely and chock full of clever ideas to be inspired by. Here are a couple of mental notes I took to share with you. How about a wall gallery of metal prints;(yes, Shutterfly makes metal prints, who knew?) artfully displayed with LED lights? The effect was just gorgeous. Really smart and so impactful! Or using a wood print in place of a stainless steel bath caddy by placing it across a claw foot tub? Why didn’t I think of this before? Or what about recreating a favorite antique china plate onto melamine dishware for outdoor entertaining? Yes, they make dishes too! Especially genius for those of us who scour thrift stores and always seem to find a single gorgeous plate without the rest of the set. 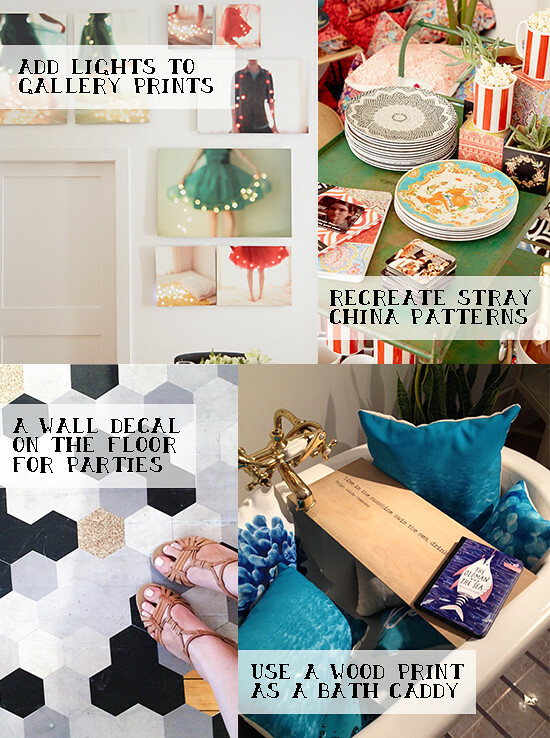 Or what about using a wall decal on the floor as a very clever party decoration? Ok, enough gushing. I think you get the idea. 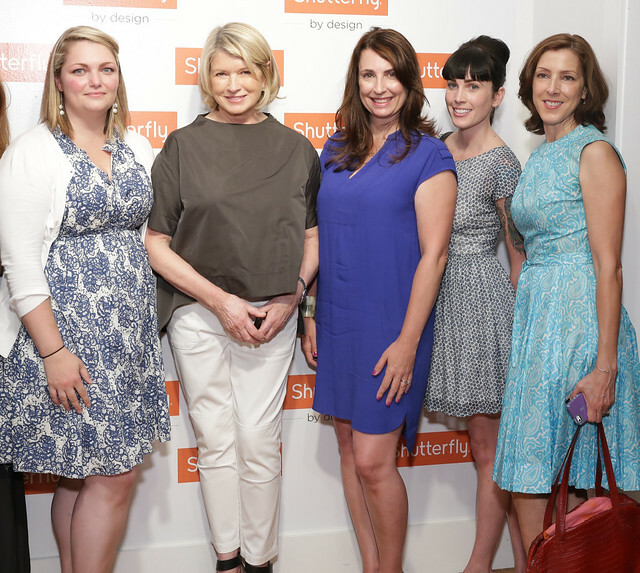 After seeing all that goodness, it was time to shake hands and make weird expressions next to Martha Stewart. I was so excited about it all, my brain must have malfunctioned and put an immediate stop order on the brain synapse that tells my face to smile. Despite the lack of photo evidence, TRUST - I was dancing on the inside. Added bonus for meeting some other talented ladies as pictured above - Kelly of Eclectically Vintage, Alana Jones-Mann & Linda Facci. After that red-letter moment, we were off to a cocktail party at Kevin Sharkey’s gorgeous Tribeca apartment. 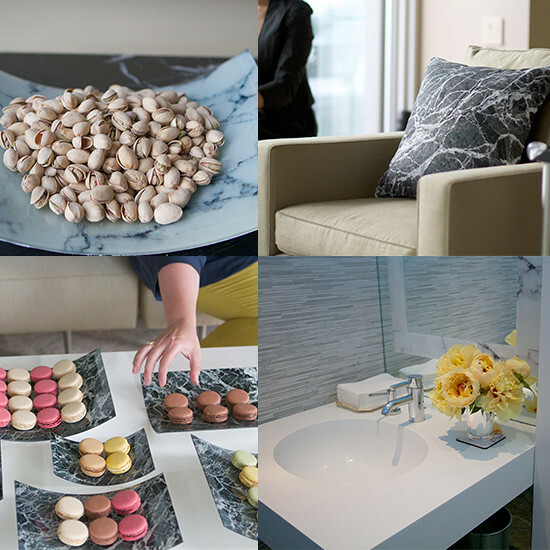 For the event, he put his own spin on some of the Shutterfly products using a marble pattern. For example, he created a faux marble umbrella stand using an oversized floor vase and wall decal. Then using that same decal, created an inlaid marble look on his bathroom mirror. The same pattern was repeated on pillows, curved glass prints, used as serving dishes, tableware, and notepads for a classic, timeless look. But the fun doesn’t end there. Shutterfly has asked me to try out a few products in my own home. Once again, the answer was a definite yes! After all the eye candy I experienced at the event, my head is swimming with ideas. Disclosure: This post was sponsored by Shutterfly and Martha Stewart but all of the opinions expressed are my own. Too too cool. So jealous you got to meet Martha! I didn't create these but if I were going to recreate them, I would buy a drill bit that works well with metal (its noted on the package but you can always ask the hardware sales people for help) and then drill a hole just large enough for the led light. These LED lights from Amazon get some good reviews. If you have any specific questions I'd be happy to get in touch with Shutterfly and see if they can answer for you. Just let me know. Such awesome, inspiring pics! I had bought battery operated LED lights awhile ago, but the project I was considering seemed too complicated and time consuming. I LOVE the idea of adding them to a gallery print. Off to Shutterfly to check out their products! Thanks for the great post. Your picture with Martha is amazing, too!!! Do you know if they used a metal print or their wooden wall art for their gallery wall with the lights? I only ask because the project I was considering prior was gluing a large print onto a wooden board and then drilling holes for the lights. But I love the idea of just ordering Shutterfly's Wood Wall Art (or metal print) to save a step. The whole thing would probably look cleaner on the edges too. :) Thanks again! The one in the image is a metal print. I had mistakenly originally identified it as wood but I think the sheen on the metal mix with the light makes a lot more sense. So lucky! What an awesome event for you to attend. Thanks for sharing. hey I think you look way better than the lady to the other side of her in the blue dress! 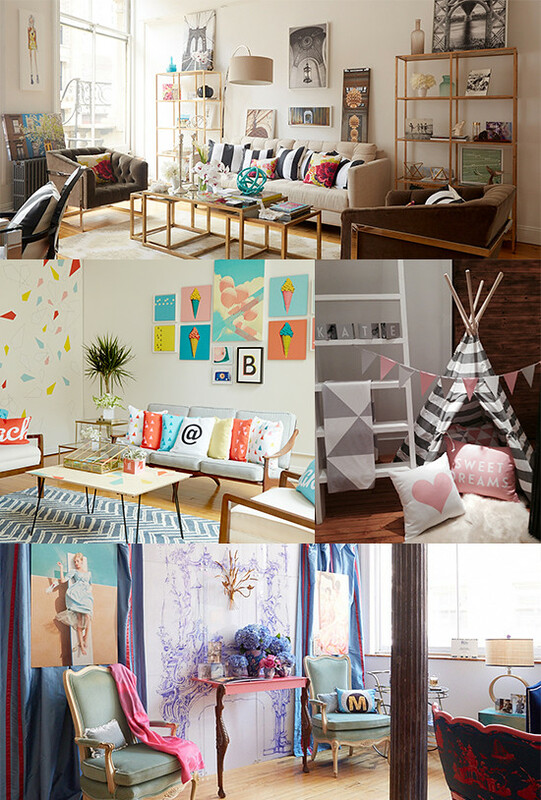 Oh my goodness, I can only imagine the creativity energy buzzing around that room! Congratulations!